You are looking for maternity bridal gowns, but can't find what you want. So you decide to get a regular bridal gown. Which size should you buy? Should you purchase a wedding dress that is 1 size bigger or maybe 2 or 3 sizes bigger? Are there certain styles that work better than others? What if you bought a gown and later became pregnant you may wonder... Can it be adjusted to let it out? These questions and more will be answered for you. What Size Regular Style Wedding Dress Should I Get? If you decide to go with a regular wedding gown instead of shopping for maternity bridal gowns... make sure you look at styles that will accommodate your stomach. Think about how far along you will be when you get married. The best maternity bridal gown style is an empire waist gown, with fullness in the skirt. If you get a style like this you can probably get your actual size or 1 size bigger to accommodate an expanding bustline and stomach. But if you choose an a-line, princess line or other fitted styles to use as a maternity bridal gown, you will need to buy a bigger size. If you are going to be only 3 or 4 months along, you may not have to go up in size or just 1 size bigger. If you are 5 to 6 months you probably need 2 sizes. If you will be 7 to 9 months along you probably will need to go up 2 to 3 sizes if you use an empire waist style. I do not recommend that you choose the more fitted styles if you will be 7 to 9 months pregnant. Why? Your alterations cost will be huge!!! This is because your gown will have to be practically taken apart and re-sewn. Some styles with elaborate detailing on the bodice can't be altered well. At this stage of pregnancy, it would be best to shop for maternity bridal gowns. If you are a pregnant bride wanting to wear a regular gown, and will be more than 5 months pregnant, it's a given fact that you will have to buy your gown big enough to fit your stomach. But this will automatically make the bust area too big. Your bust area will grow also, but not at the proportion that your stomach will grow. So it is important that the wedding gown style you choose is simple and not full of details. Also the best neckline type to alter is the strapless neckline, because there are no armholes in this style of dress. Avoid styles that have sleeves and or have armholes like a tank style sleeveless dress. Armholes in a gown can only be taken up a little before it distorts it. So if you are going to wear a regular gown that might need altering... find a qualified wedding dressmaker/ alteration specialist to talk to about this before you order your gown. They can direct you by suggesting styles that will work better than others when it comes to alterations. "I Have A Dress Already What Can Be Done To Alter It?" Are you a bride who during your wedding planning found out that you are pregnant, and you have also already purchased your wedding gown? Can anything be done to make a regular wedding dress work for a pregnant bride? 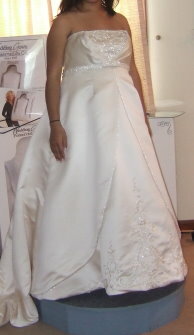 It depends on the style and fit of your bridal gown, whether it can be altered to fit you. Also it depends on how large you will be at the time of your wedding. There are two ways to resize a wedding dress so that it is larger. The first way is to add gussets (which are panels) to the sides of the gown. Sometimes you can add them to the back center seam. To make your gown into a maternity bridal gown, your gown can be made larger by taking out the zipper and convert it into a corset wedding gown. This is the best way to adjust your gown to make it larger, because in most cases the corset lace up back adds to the gown design. 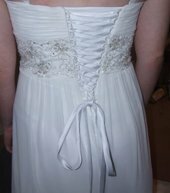 But not all designs lend themselves to adding a corset lace up back. Again, consult with a sewing professional. "The picture above is of a gown that was too small for the bride because she became pregnant after purchasing a gown. The opening you see is the amount that her zipper spread apart and could not close. The solution was to convert this into a lace up back and add a modesty panel. She was very happy because it looked like the gown was designed this way and no one would be the wiser." Do you have a question or comment you want to make? What do you need to know about getting your wedding dress altered if you are a pregnant bride? Read these suggestions and advice to make your alteration experience go off without a hitch!